Jim Speta has been a member of the faculty at Northwestern Pritzker School of Law since 1999. He is currently the Senior Associate Dean for Academic Affairs and International Initiatives and Director of Executive LLM Programs. His research interests include telecommunications and Internet policy, antitrust, administrative law, and market organization. He teaches in the Law School and in the Joint Program in Law and Business operated by the Law School and the Kellogg School. A 1991 graduate of the University of Michigan Law School, Speta joined the Northwestern faculty following a one-year visit. He had previously clerked for Judge Harry T. Edwards on the United States Court of Appeals for the D.C. Circuit and practiced appellate, telecommunications, and antitrust law with the Chicago firm of Sidley & Austin. 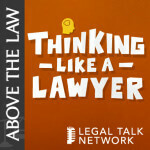 This legal podcast covers net neutrality, online privacy, cybersecurity, and how the government is handling these growing issues.